A car bomb outside an American base killed nine people Sunday and injured 30 others — including three U.S. soldiers — and insurgents blasted Iraqi police stations in a Shiite neighborhood of Baghdad and in a town south of the capital. A U.S. soldier was killed in a mortar attack. was blown up Sunday after insurgents raked the building with gunfire, ordered Iraqi police to leave, planted explosives and detonated them. Two explosions were heard late Sunday in central Baghdad, but the location and cause could not be determined. Meanwhile, a U.S. security company confirmed Sunday that four of their employees — two Americans and two Poles — were killed the day before in an ambush on the main road to Baghdad airport. The company, Blackwater USA, lost four employees in an ambush last March in Fallujah that triggered the bloody three-week siege of the restive Sunni Muslim city. The stepped-up attacks raise questions about the capability of Iraqi forces to control public order after sovereignty passes to a new interim government at the end of this month. Iraq's new prime minister, Iyad Allawi, told British Broadcasting Corp. television that military decisions taken after the June 30 transfer of sovereignty must be approved by the Iraqi government. The U.N. Security Council is considering a U.S.-British resolution on the blueprint for the power transfer, including the thorny issue of how much control the Iraqis will exert over multinational military operations. Also Sunday, the U.S. military freed more detainees from the notorious Abu Ghraib prison, the center of the scandal involving abuse of inmates by American soldiers. The release was the fourth major one from the facility since the scandal broke in April. Some of the 320 detainees released Sunday complained they were forced to eat food fit only for animals, though they said the quality had improved in recent weeks. Assailants also ambushed two civilian sport utility vehicles on the road to Baghdad's international airport on Saturday, killing two Americans and two Poles working for Blackwater USA. Radical Shiite cleric Muqtada al-Sadr met in Najaf Saturday with Iraq's most influential spiritual leader Grand Ayatollah Ali al-Husseini al-Sistani for the first time since al-Sadr launched an uprising against the U.S.-led coalition in April. A roadside bomb killed an American soldier and wounded three in a series of attacks Saturday against occupation forces and their Iraqi allies, while tensions eased in the Shiite holy cities of Najaf and Kufa just weeks ahead of the transfer of sovereignty to the new Iraqi government. Gunmen killed the brother of the man who told the U.S. Army where to find Saddam Hussein's sons, who were killed in a hail of gunfire July 22, witnesses and hospital officials said Saturday. Salah al-Zidani was traveling in a car when gunmen in a passing vehicle opened fire, a hospital official said. Al-Zidani died instantly and three companions were injured, the officer said. U.S. officials have not publicly confirmed who turned in Odai and Qusai Hussein, but numerous figures in Mosul have identified him as Nawaf al-Zidani, who collected the $30 million reward - $15 million for each son. Some 200 anti-war demonstrators rallied in Washington Saturday. Among those addressing the crowd was Michael Berg, the father of Nicholas Berg, who was beheaded in Iraq. French President Jacques Chirac Chirac told Presdient Bush at their meting in Paris Saturday that he believed the evolving U.N. resolution on Iraq would pass unanimously, according to a U.S. official familiar with the session who spoke on condition of anonymity. On Monday, the U.N. security Council will here from U.N. envoy Lakhdar Brahimi, who helped put together the interim government that will assume power on June 30. "We're getting near the end of the process and we'd like to vote soon," said Richard Grenell, spokesman for the U.S. Mission to the United Nations. The car-bombing occurred at the gate of the Taji air base, a former Iraqi air force facility used by the U.S. Army about 12 miles north of Baghdad. It was unclear if the explosion was a suicide attack. 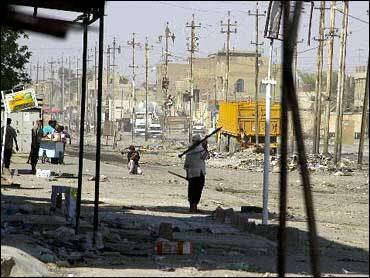 Ambulances, Humvees and Iraqi police rushed to evacuate the injured, while American troops secured the area. Meanwhile, the U.S. command reported that an American soldier was killed Sunday morning and another wounded in a mortar attack on the 13th Corps Support Command base near Balad north of Baghdad. Later Sunday, gunmen attacked the Karama police station in Sadr City, the scene of clashes between the Americans and gunmen loyal to radical Shiite cleric Muqtada al-Sadr. The assailants ordered police to file out of the blue-painted single story building, rigged it with explosives and detonated the charges, engulfing the building in a cloud of smoke. In a similar attack, eight people disguised as police entered a police station late Saturday in Musayyib, about 45 miles south of Baghdad, and shot dead seven officers before blowing up the building. U.S. and Iraqi officials said they were uncertain who was behind the attack, which occurred in a mixed Shiite-Sunni area along the Euphrates river. Also Sunday, a vehicle carrying a crew from the Arabic-language satellite television broadcaster Al-Jazeera was attacked by five gunmen near Iskandariyah south of Baghdad, the station said. The team managed to escape unharmed after a 20-minute chase. Late Sunday, a roadside bomb exploded in Ramadi, a Sunni city west of Baghdad, killing two policemen and injuring six others, according to police Capt. Zyad al-Juburi. The ambush along the airport road was the latest in a series of attacks against civilian contractors, who provide security for private companies in Iraq. The attacks have complicated the task of rebuilding Iraq following decades of war, economic sanctions and Saddam Hussein's tyranny. A company official in Baghdad, speaking on condition of anonymity, said gunmen opened fire with automatic weapons as the security guards were en route to the airport to pick up a client. Four men in one vehicle died on the spot. Three others in a second vehicle managed to flag down a passing car and escape. Company spokesman Chris Bertelli, speaking by telephone from Washington D.C., said the convoy was attacked "from a couple of different angles by four or five vehicles with four or five people each." One bright spot, however, was the situation around the Shiite holy cities of Najaf and Kufa, where Iraqi police have been reasserting their control from al-Sadr's gunmen after nearly eight weeks of fighting. The U.S. Army agreed to a request from the Najaf governor to keep U.S. troops away from the Imam Ali Shrine in Najaf and the mosque in Kufa where al-Sadr preaches to give Iraqi security forces a chance to ease tensions. U.S. officials said they agreed with the request after receiving assurances that al-Sadr's militia had been significantly weakened in weeks of clashes with American forces. In Baghdad, Brig. Gen. Mark Hertling, deputy commander of the 1st Armored Division, said U.S. troops had killed more than 1,000 militiamen in fighting in Najaf, Karbala and Kut — Shiite cities where al-Sadr's gunmen had been active. Al-Sadr launched his uprising in early April after the U.S.-run occupation authority closed his newspaper, arrested a key lieutenant and announced a warrant for his arrest in the April 2003 murder of a moderate cleric in Najaf. Shiite religious and political leaders convinced al-Sadr to pull his troops off the streets in return for assurances that the future of his militia and the status of the arrest warrant would be discussed in future talks with the clerical hierarchy.